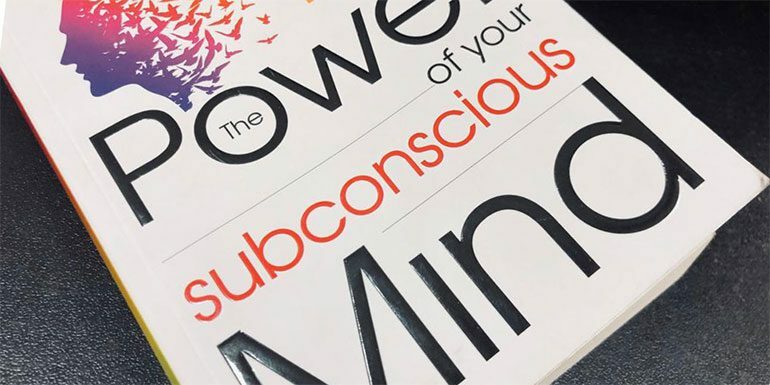 The Power of Your Subconscious Mind by Dr. Joseph Murphy explains great fundamental truths about the conscious and the subconscious mind in simple language. Article by Vijay Miyatra – the content editor for IMTips. So without much of an ado, I will hand it over to him. 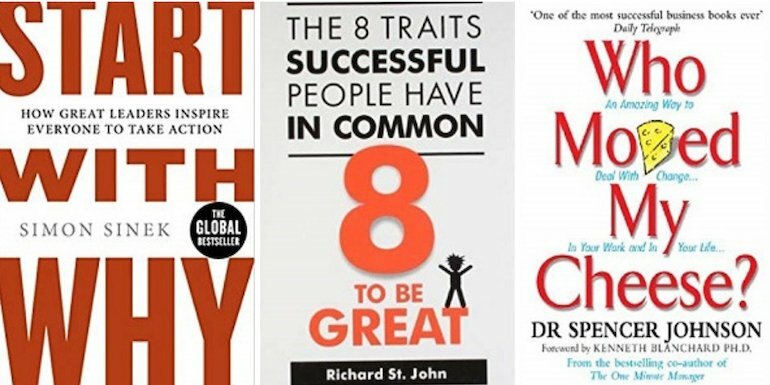 I came across this book while writing 30+ Books Every Entrepreneur Should Read in 2019. The synopsis thrilled me because I believe in the thought process of mind. Amazon was quite good in delivering the book without delay. The reason to wake up early was to practice the theory explained in the book. The arguments of affirming your subconscious mind and manifesting desired results into real life. Surprisingly, this is the true reason why I bought this book. I wanted to experience whether the subconscious manifestation as written in this book still works in 2019 or not. While reading you will encounter certain words throughout the book. These words are infinite intelligence, creative intelligence, infinite healing presence, immense riches, infinite wisdom & power. All of them means the universal consciousness. In other words, “GOD”. The Doctor Dresses the Wound and God Heals it. The book teaches how one should scientifically pray (or say conclusively) to establish a harmonious interaction between the conscious and the subconscious mind. I firmly believe this book will teach you to discover the infinite power and intelligence within you to achieve success and wealth in your life. Be sure you read this book again and again. Each and every chapter will pratically teach you how the subconscious mind works miraculously for you. Learn the simple tricks to impress your subconscious mind and it will do wonders. Now in real life, everyone desires perfect health, wealth, happiness, success, stability, security and peace of mind. The question is how many of us achieve. We all know that if we do xyz things our condition will improve. We know that. But what we don’t have is any specific techniques or process to follow. In difficult times our mind wanders here and there. As a result, we lose the capability of thinking and acting rationally. Hence, to deal with such a situation, the book outlines natural formulas, a specific and straightforward workable pattern to achieve particular goals. The mind doesn’t exist anywhere in our physical body. It’s a collection of thoughts. The brain has into two parts – Conscious & Subconscious. Also known as the objective and the subjective, the voluntary and the involuntary or the rational and the irrational mind. When you think correctly with your conscious mind and deposit constructive, harmonious & peaceful thoughts in your subconscious the magic begins. Whatever you impersonate on your subconscious mind it is expressed in the form of the condition, experiences, and events. That’s how things work. Let’s say you want to learn Physics. So, to learn physics, you need first to understand the universal principles of physics that are unchangeable and applicable. If you throw a ball high in the sky the gravitational force of the earth will pull it down. That’s how it works. And it’s universally accepted. In the same fashion, if you want to learn chemistry, you must follow its universal principles like combining two atoms of hydrogen and one atom of oxygen will give you water. You will never get water (by denying the basic principles of chemistry) if you add one more atom of oxygen in the above formula. In the same way, if you want to make use of the powers within your subconscious mind, you must learn its principles. 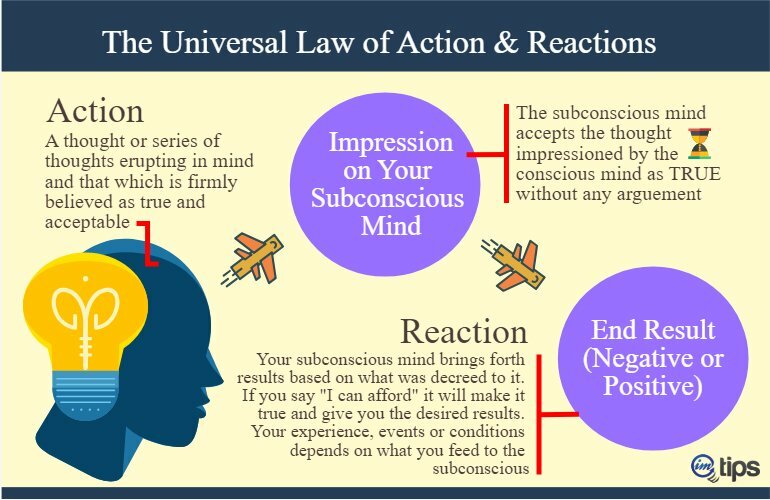 The Subconscious Mind works on the Law of Belief. The Law of Belief works on the Law of Mind. Eventually, Belief is the Thought of your Mind. In simple words, a thought in your conscious mind whether negative or positive impresses the subconscious and you get the result. If you feed negative feelings, you get negative results and vice versa. The conscious mind is the master of your body. It operates your thought process and gives you relevant experiences, events, and actions happening in your life. On the other hand, the subconscious depends on your conscious mind. It takes orders either negative or positive without distinguishing and gives you the result. The subconscious doesn’t interfere in what is wrong or right. It has no decision making power. The psyche will believe everything that is accepted and understood as correct by the conscious mind. For example, if you go on repeating “I can’t do” in the conscious mind, your subconscious will accept it as true. The reason behind this theory is the psyche cannot argue or oppose what is referred to it. If you give negative impressions, it will work heaven and earth to bring forth the negative results. The same happens if you give positive ones. The choice is yours. You will have to decree positive affirmations to the subconscious like success, wealth, freedom, happiness and health. Affirm it with 100% authority and more profound conviction to get best results. Replace negative suggestions with powerful positive ones. Counteract “I Can’t Do” with “I Can”. Do this daily, at least twice a day: one in the morning as soon as you get and the second in the night before you sleep. I read somewhere – “It is not important which book you read, but what you do after you close the book“. Hence, I decided to give it a try. I chose to provide a positive affirmation to my subconscious. One night just before the sleep I experimented. I laid down comfortably on my bed, phone on silent mode, eyes closed, relaxed my body as best as I could. And reciting the positive affirmations. Here is what I did. It started with completely relaxing the body and mind. “I am relaxed, calm, poised and serene. My mind and body are relaxed. Every single cell, tissue, fiber & muscle of the body is relaxed. The creative intelligence of my subconscious mind has every solution to my problem. It is true that universal consciousness gives me abundance and riches that I possess. I grace each and every living and non-living things in this universe for making this planet such a beautiful world to live. I started with thanking my parents, friends and family members. Thank you, mom and dad, for giving me a good upbringing. Thank you to all my family members for what they do for me day in and day out. A big thank you to all those who help me achieve success in my life. My body that works tirelessly the whole day, I pay gratitude towards it. I thank my subconscious who operates all the vital functions of my body without my help. Happy and healthy is my actual being. I forgive everyone who hurt me or did something wrong with me and I ask forgiveness whom I have hurt intentionally or unintentionally. I release all the hurt, anger, grief, guilt and frustration from my mind, body, and soul. Now, they bound me no more. The universal consciousness is blessing all these wonderful human beings. May peace be upon them always. After relaxation, gratitude, and forgiveness the final affirmations come. Infinite intelligence leads and guides me in all my ways. Perfect health is mine, and the law of harmony operates in my mind and body. Beauty, love, peace, and abundance are mine. The principle of right action and divine order govern my entire life. I know, feel, and believe that my subconscious mind responds according to the nature of my conscious mind’s thinking. The next morning was excellent! I felt light like a feather. Deep down a sense of peace and calmness was restored. Now I am doing this every day in and out. The critical point is feelings. If you pay gratitude to your parents, you must feel the same. You will have to picture your parents in your thoughts and feel the same. If you do something with feeling results are guaranteed. While I was mimicking these positive affirmations on my subconscious mind, I was feeling the same. The thankyou pushed me near to the subconscious existence. It’s a training process. You need to do it on a daily basis. Our conscious mind is susceptible to negativity. It leaves no opportunity to grab a negative thought and pass it on to the subconscious. Reciting positive affirmations can get you unbelievable results. The mind has couple of different characteristic functional parts: The Conscious and the subconscious. The subconscious mind has healing power which has created me and is maintaining all the vital functions of my body. Why people get the opposite of what they pray? It is because they don’t pray effectively. The subconscious mind existed even before you, me and this world. There are two kinds of people: One those who are full of confidence and faith and the rest who are full of fears and doubts. Within our subconscious mind there lie infinite wisdom, power, and supply of all that is necessary for life. We don’t need to go anywhere to get these powers; it is already present within us. The fact is we will have to learn to use it. Through the power of the subconscious mind, anyone can attract an ideal life partner, money or desired job. There is a magical force of energy in the subconscious mind that can heal a troubled mind or a broken heart. If you want to use the divine power of your subconscious mind, then you must learn its principles. The subconscious mind works on the cause and effect theory. Never finish a negative statement. Reverse it and wonders will follow. Suggestions are tremendously powerful. If you accept a suggestion mentally its power arises.